FO Friday: Aneeta Patel Fever! As I eagerly await Mr.Postman to deliver my soft and squishy parcel, here are my Finished Objects of the week! Alright so I'm cheating, I didn't finish them this week, they were finished about 2 weeks ago when I fled the blogging scene. First up is a pair of Liquorice Alsorts Baby Mitts. The pattern is by Aneeta Patel, although she just does plain mittens, I decided to spice it up my doing two! They don't look that great in the photograph, but they are very cute in real life. Next up is another pair of mitts from the same pattern, but this time in plain red! I decided to make a matching pair of booties! The pattern is by Aneeta Patel, and she has the pattern for free here if you'd like to give it a bash! I decided to do the last few rows in stocking stitch, for a cute rolled edge! And the last FO from when I was sick with Aneeta Patel fever is my Phone Cover, which she calls a Phone Home. Although I like to call it my iTee! I'm not that pleased with it, but it does what its meant to so I can't really complain. Want to thank you all for the lovely comments you left me on Wednesday, I'm very pleased so many people share the Moss Stitch love! I did finish my headband, but if you want to see that one and others I've been working on, you'll have to pop over on Monday, when H is for... Headbands! I'll be posting again tomorrow with a brand new meme I'm taking part in, so don't forget to come and pay a visit! 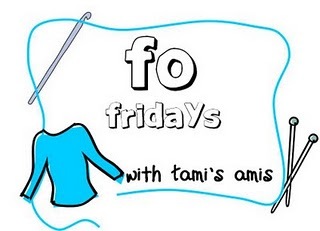 For now though, go get your weekly FO fix over at Tami's Amis! I love the mittens they are very cute! I have also made the bootees from Aneeta Patels book but I love the rolled top you gave them, I gonna have to try that! Awww, the mitts and booties are so sweet!!! Love the "itee!" How fun! I wonder if you'd like the phone cover more if it was in stockinette instead of garter so it'd look more like a proper t-shirt? Very cute mits and booties! Kudos to you for being able to do them. I can't do the fine work anymore. @ Calophi: That is an genius idea, thank you my dear! Those mitts are SO cute. I wish I'd been better at knitting when my son was born, because I would have made him some. I hated the store-bought mitts but he sure needed them. . .
Those black and yellow mitts are fantastic! Look at all the cute stuff you finished! I love how squishy garter stitch is, and the mitts are adorable.